Budgen, Frank. 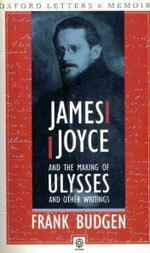 James Joyce and the Making of Ulysses. Bloomington: Indiana University Press, 1960. 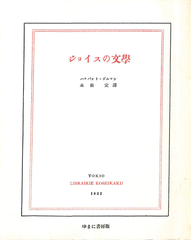 1st ed, 1934. Here is the best possible introduction to the Joyce world - an unpretentious, reliable, highly animated guide to what the new reader will find in Ulysses. Thousands of readers every year make the aquaintance of the Bloomsday chronicle, a book no one, least of all the author, expected us to absorb casually. A mentor is advisable: not an unreasonable prerequisite for one of the key books of the space age. Here Mr. Budgen is unexcelled. He does not sluice our minds with irrelevant ideas generated by the technical novelties of Joyce's text. His training in Impressionist painting accustomed him to the notion that the man who is fabricating a work of art employs deliberate procedures. Hence the case with which he installs his reader in a world where the bizarre modes of presentation are the book - more than an exercise in mechanics, opening as they do on every province of human life. 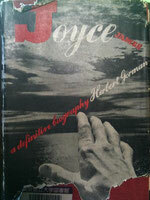 Myth, symbol, doctrine, device, scheme, key, correspondence - all these components of Joyce's work enter Mr. Budgen's reckoning, and all of them turn out to be necessary details in a human enterprise dominated, for him, by a human being of genious. The statements above are paraphrased from Hugh Kenner's introduction to this new edition of Mr. Budgen's invaluable book. Based on a friendship between Joyce and Budgen which began in Zurich during the First World War (when Joyce was about midway in the writing of Ulysses), this intimate account brings Joyce to life as no other study by a contemporary has ever done.